Chicago Tribune rock critic Greg Kot recently stated following Cut//Copy's summer performance at The Pitchfork Music Festival that he felt the band seemed just one hit song away, one 1901 or Listzomania, from a Phoenix-like mass market breakthrough. My suggestion to listeners is "Why wait?" They may not have the hit single yet, but with the release of Zonoscope, the Australian lads have proven for two albums in a row now that they're basically the best 80s flavored electronic/dance act out there not named Daft Punk, Robyn, or LCD Soundsystem, and are quite possibly the most broadly appealing bunch of the lot. Following on the heels of their excellent 2008 release In Ghost Colours, Zonoscope is just another winning collection of electronic numbers given the warmest/poppiest of spins. The high points are maybe a touch lower this time out, but the album boasts a slightly more muscular, consistent, and streamlined approach that more than compensates. And once again, though not composed of conventionally great singers, the band's secret weapon remains their inventive, sly backing vocals, which seem to incorporate just about every sophisticated trick from the 80's new wave canon. Highlights include the urgent, John Hughes-y opener Need You Now; best track Where I'm Going, which somehow seems to simultaneously reference classic Beach Boys, the Who's Won't Get Fooled Again and The Beatles Tomorrow Never Knows, all while still delivering the requisite dance-rock punch; the buoyant Alisa; the Men At Work-flavored Take Me Over, and fifteen-minute closer Sun God, which hits a muscular LCD Soundsystem-like groove and never lets up. But too much emphasis on individual highlights misses the point. This is one of the most enjoyable front-to-back listens of the year. It might be a bit on the disposable side...these upbeat songs aren't cut of a stock that sticks with you much after a listen...but conversely, the album is a tremendous grower. It's sounded better to me every time I've given it a spin, it always puts me in a good mood, and frankly, I can't wait to throw it on again. Cherry Picker's Best Bets: Need You Now, Where I'm Going, Pharaohs & Pyramids, Alisa. Here's the official video for album opener Need You Now. 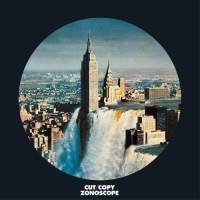 What are your thoughts on Cut//Copy's Zonoscope? Let readers know!